The new multimedia standards (for example, MPEG-21) facilitate the seamless integration of multiple modalities into interoperable multimedia frameworks, transforming the way people work and interact with multimedia data. These key technologies and multimedia solutions interact and collaborate with each other in increasingly effective ways, contributing to the multimedia revolution and having a significant impact across a wide spectrum of consumer, business, healthcare, education, and governmental domains. 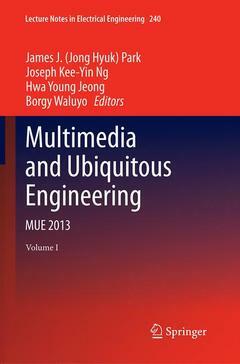 Multimedia and Ubiquitous Engineering provides an opportunity for academic and industry professionals to discuss recent progress in the area of multimedia and ubiquitous environment including models and systems, new directions, novel applications associated with the utilization and acceptance of ubiquitous computing devices and systems. Multimedia Modeling and Processing. Multiwedgelets in Image Denoising; A.Lisowska. A Novel Video Compression Method Based on Underdetermined Blind Source Separation; J.Liu, et al. Grid Service Matching Process Based on Ontology Semantic; G.Zhang, M.Li. Enhancements on the Loss of Beacon Frames in LR-WPANs; J.-H.Park, B.-S.Kim. Case Studies on Distribution Environmental Monitoring and Quality Measurement of Exporting Agricultural Products; Y.Kwak, et al. Vision based approach for driver drowsiness detection based on 3D head orientation; B. AKROUT, M.WALID. Potentiality for Executing Hadoop Map tasks on GPGPU via JNI; B.Gu, et al. An Adaptive Intelligent Recommendation Scheme for Smart Learning Contents Management System; D.-E.Cho, et al. Ubiquitous and Pervasive Computing. An Evolution Path-Based Analysis of Social Experience Design; T.Yamakami. Block IO Request Handling for DRAM-SSD in Linux Systems; K.Jun. Implementation of the Closed Plant Factory System based on Crop Growth Model; M.-B.Lee, et al. Ubiquitous Networks and Mobile Communications. An Energy Efficient Layer for Event-Based Communications in Web-of-Things Frameworks; G.Bovet, J.Hennebert. A Secure Registration Scheme for Femtocell Embedded Networks; I.Syed, H.Kim. Intelligent Computing. Unsupervised Keyphrase Extraction based Ranking Algorithm for Opinion Articles; H.Ryang, U.Yun. A Frequent Pattern Mining Technique for Ranking Webpages based on Topics; G.Pyun, U.Yun. Trimming Prototypes of Handwritten Digit Images with Subset Infinite Relational Model; T.Masada, A.Takasu. Ranking Book Reviews based on User Influence; U.Yun, H.Ryang. Speaker Verification System Using LLR-based Multiple Kernel Learning; Y.-H.Chao. Edit Distance Comparison Confidence Measure for Speech Recognition; D.Skurzok, B.Ziolko. Weighted pooling of image code with saliency map for object recognition; D.Kim, et al. Calibration of Urine Biomarkers for Ovarian Cancer Diagnosis; E.-S.Yang, et al. An Iterative Algorithm for Selecting the Parameters in Kernel Methods; T.Zhiying, et al. A Fast Self-Organizing Map Algorithm for Handwritten Digit Recognition; Y.Wang, et al. Frequent Graph Pattern Mining with Length-Decreasing Support Constraints; G.Lee, U.Yun. An Improved Ranking Aggregation Method for Meta-search Engine; J.Feng, et al. Multimedia and Ubiquitous Computing Security. Identity-based Privacy Preservation Framework over u-Healthcare System; K.Mtonga, et al. A Webmail Reconstructing Method from Windows XP Memory Dumps; F.Kong, et al. On Privacy Preserving Encrypted Data Stores; T.Raybourn, et al. Mobile User Authentication Scheme Based on Minesweeper Game; T.Kim, et al. Design and Evaluation of a Diffusion Tracing Function for Classified Information among Multiple Computers; N.Otsubo, et al. DroidTrack: Tracking Information Diffusion and Preventing Information Leakage on Android; S.Sakamoto, et al. Three Factor Authentication Protocol based on Bilinear Pairing; T.F.Vallent, H.Kim. A LBP-based Method for Detecting Copy-Move Forgery with Rotation; N.Zheng, et al. Attack on Recent Homomorphic Encryption Scheme over Integers; H.Yang, et al. A New Sensitive Data Aggregation Scheme for Protecting Data Integrity in Wireless Sensor Network; M.Yoon, et al. Reversible Image Watermarking Based on Neural Network and Parity Property; R.Ni, et al. A based on Single Image Authentication System in Aviation Security; D.G.Lee, J.W.Han. Multimedia and Ubiquitous Services. A Development of Android Based Debate-learning System for Cultivating Divergent thinking; S.Kim, et al. Development of a Lever Learning Webapp for an HTML5-based Cross-platform; T.Kim, et al. Looking for Better Combination of Biomarker Selection and Classification Algorithm for Early Screening of Ovarian Cancer; Y.-S.Kim, et al. A Remote Control and Media Sharing System Based on DLNA/UPnP Technology for Smart Home; T.-H.Yu, S.-C.Lo. A New Distributed Grid Structure for k-NN Query Processing Algorithm based on Incremental Cell Expansion in LBSs; S.Hong, et al. A New Grid-based Cloaking Scheme for Continuous Queries in Centralized LBS Systems; H.-I.Kim, et al. New Database Mapping Schema for XML Document in Electronic Commerce; E.-Y.Kim, S.-H.Chun. A Study on a Location-based Reservation Management Service Model using a Smart Phone; N.Bae, et al. A Real-time Object Detection System using Selected Principal Components; J.-H.Kima, et al. Trajectory calculation based on position and speed for effective air traffic flow management; Y.-K.Kim, et al. Multimedia Entertainment. Design and Implementation of a Geometric Origami Edutainment Application; B.Kim, et al. Gamification Literacy: Emerging needs for identifying bad gamification; T.Yamakami. Automatic Fixing of Foot Skating of Human Motions from Depth Sensor; M.Sung. IT and Multimedia Applications. A Study on the Development and Application of Programming Language Education for Creativity Enhancement - Based on LOGO and Scratch; Y.Yang, et al. Design and Implementation of Learning Content Authoring Framework for Android-based Three-Dimensional Shape; E.Kim, et al. A Study on GUI Development of Memo Function for the e-book; J.A.Kim, J.K.Kim. Relaxed Stability Technology Approach in the Organization Management: Implications from Configured Control Vehicle Technology; T.Yamakam. Mapping and Optimizing 2-D Scientific Applications on a Stream Processor; Y.Zhang, et al. Development of an Android Field Trip Support Application Using Augmented Reality and Google Maps; D.Hyun, et al. Implementation of Automotive Media Streaming Service adapted to Vehicular Environment; S.Y.Lee, et al. The Evaluation of the Transmission Power Consumption Laxity-Based (TPCLB) Algorithm; T.Enokido, et al. The methodology for hardening SCADA Security using countermeasure ordering; S.-H.Kim, et al. Development and Application of STEAM based Educa-tion Program Using Scratch; J.Oh, et al. Advanced Technologies and Applications for Cloud Computing and Sensor Networks. Performance Evaluation of Zigbee Sensor Network for Smart Grid AMI; Y.Jeon. P2P-based Home Monitoring System Architecture using a Vacuum Robot with an IP Camera; K.Choi, et al. Design and Simulation of Access Router Discovery Process in Mobile Environments; D.Lee, J.-M.Gil. Integrated SDN and non-SDN Network Management Approaches for Future Internet Environment; D.Kim, et al. Analysis and Design of a Half Hypercube Interconnection Network; J.-S.Kim, et al. Aperiodic Event Communication Process for Wearable P2P Computing; T.-G.Lee, G.-S.Chung. Broadcasting and Embedding Algorithms for a Half Hypercube Interconnection Network; M.Kim, et al. Obstacle Searching Method Using a Simultaneous Ultrasound Emission for Autonomous Wheelchairs; B.-S.Song, C.-G.Kim. Future Technology and its Application. A Study on Smart Traffic Analysis and Smart Device Speed Measurement Platform; H.-J.Joo, et al. Analysis and Study on RFID Tag Failure Phenomenon; S.Cho, et al. Administration management system design for smart phone applications in use of QR code; S.-M.Won, et al. Use of Genetic Algorithm for Robot-posture; D.W.Kim, et al. Use of Flexible Network Framework for Various Service Components of Network Based Robot; D.W. Kim, et al. China's Shift in Culture Policy and Cultural Awareness; K.Lim. China's Cultural Industry Policy; W.Lee, K.Lim. Development of mobile games for rehabilitation training for the hearing impaired; S.Cho, et al. A Study to prediction modeling of the number of traffic accidents; Y.-S.Chung, et al. Pervasive Services, Systems and Intelligence. A Wiki-based Assessment System towards Social-empowered Collaborative Learning Environment; B.C.Kao, Y.H.Chen. Universal User Pattern Discovery for Social Games – An Instance on Facebook; M.M.Weng, B.C.Kau. Ubiquitous Geography Learning Smartphone System for 1st Year Junior High Students in Taiwan; W.-C.Chang, et al. Housing Learning Game Using Web-Based Map Service; T.-H.Wang. Digital Publication Converter--From SCORM to EPUB; H.-P.Chang. An Intelligent Recommender System for Real-Time Information Navigation; V.Hsu. Advanced Mechanical and Industrial engineering, and Control I. Modal Characteristics Analysis on Rotating Flexible Beam Considering the Effect from Rotation; H.Yin, et al. The Simulation Study on Harvested Power in Synchronized Switch Harvesting on Inductor; J.Park, et al. An Approach for a Self-Growing Agricultural Knowledge Cloud in Smart Agriculture; T.Kim, et al. Determination of water-miscsible fluids properties; J.Zajac, et al. Influence of Technological Factors of Die Casting on Mechanical Properties of Castings from Silumin; S.Gaspar, J.Pasko. Active Ranging Sensors Based on Structured Light Image for Mobile Robot; J.Shin, S.Yi. Improved Composite Order Bilinear Pairing on Graphics Hardware; H.Xiong, et al. Deployment and Management of Multimedia Contents Distribution Networks using an Autonomous Agent Service; K.Lee. Advanced Mechanical and Industrial engineering, and Control II. Design optimization of the assembly process structure based on complexity criterion; V.Modrak, et al. Kinematics Modelling for Omnidirectional Robooling Robot; S.Yi. Design of Device Sociality Database for Zero-configured Device Interaction; J.Moon, et al. Image Processing based a Wireless Charging System with Two mobile Robots; J.-O.Kim, et al. Wireless Positioning Techniques and Location-Based Services: A Literature Review; P.Keikhosrokiani, et al. Green and Human Information Technology. Performance Analysis of Digital Retrodirective Array Antenna System in Presence of Frequency Offset; J.Bok, H.-G.Ryu. A novel low profile multi-band antenna for LTE handset; N.B.Ngoc, et al. Digital Signature Schemes from Two Hard Problems; B.V.Do, et al. Performance Improvements using Upgrading Precedences in MIL-STD-188-220 Standard; S.Han, B.-S.Kim. Blind beamforming using the MCMA and SAG-MCMA algorithm with MUSIC algorithm; Y.Kim, H.-G.Ryu. Performance Evaluation of EPON-based Communication Network Architectures for Large-Scale Offshore Wind Power Farms; M.A.Ahmed, et al. A User-Data Division Multiple Access Scheme; P. Niroopan, et al. On Channel Capacity of Two-Way Multiple-hop MIMO Relay System with Specific Access Control; P.T.Hiep, et al. Single-Feed Wideband Circularly Polarized Antenna for UHF RFID reader; P.HuuTo, et al. Experimental Evaluation of WBAN Antenna Performance for FCC Common Frequency Band with Human Body; M.Noitubtim, et al. Performance Evaluation of UWB-BAN with Friis's Formula and CLEAN Algorithm; K.Koonchiang, et al. A Study of Algorithm Comparison Simulator for Energy Consumption Prediction in Indoor Space; N.Chen, D.-H.Kim. Energy Efficient Wireless Sensor Network Design and Simulation for Water Environment Monitoring; N.T.Hong Doanh, N.T.Duc. An Energy Efficient Reliability Scheme for Event Driven Service in Wireless Sensor Actuator Networks; S.Kim. Efficient and Reliable GPS-based Wireless Ad Hoc for Marine Search and Rescue System; T.Duc-Tuyen, et al. Improved Relay Selection for MIMO-SDM Cooperative Communications; D.H.Vu, et al. Freshness Preserving Hierarchical Key Agreement Protocol over Hierarchical MANETs; H.Kim. A Deployment of RFID for Manufacturing and Logistic; P.Choeysuwan, S.Choomchuay. Real time Video Implementation on FPGA; P.M.L.Nguyen, S.B.Cho. Recovery Algorithm for Compressive Image Sensing with Adaptive Hard Thresholding; V.A.Nguyen, B.Jeon. Estimation Value for Three Dimension Reconstruction; T.-E.Kim. Gesture Recognition Algorithm using Morphological Analysis; T.-E.Kim. Omnidirectional Object Recognition based Mobile Robot Localization; S.Kim, I.S.Kweon. Gender Classification Using Faces and Gaits; H.Q.Dang, et al. Implementation of Improved Census Transform Stereo Matching on a Multicore Processor; J.Chang Kwak, et al. A Filter Selection Method in Hard Thresholding for Compressed Image Sensing; P.M.Pham, et al. Facial Expression Recognition using Extended Local Binary Patterns of 3D Curvature; S.Y.Chun, et al. Overview of Three and Four-Dimensional GIS Data Models; T.A.Nguyen Gia, et al. Modeling and simulation an intelligent trafic-light system using multiagents technology; T.T.T.Truong, C.H.Phan. A Numerical Approach to Solve Point Kinetic Equations Using Talor-Lie Series and the Adomian Decomposition Method; H.-T.Kim, et al. Regional CRL Distribution based on the LBS for Vehicular Networks; H.Kim, et al. Study of Reinforcement Learning Based Dynamic Traffic Control Mechanism; Z.Zhang, et al. Understanding and Extending AUTOSAR BSW for Custom Functionality Implementation; T.Kim, et al. A Hybrid Intelligent Control Method in Application of Battery Management System; N.Nguyen T. T, F.Bien. Interpretation and Modeling of Change Patterns of Concentration based on EEG Signals; J.Lim, et al. Design of Autonomic Nerve Measuring System using Pulse Signal; U.-H.Ji, S.-Y.Chun. Semiconductor Monitoring System for Etching Process; S.-C.Kim. Enhancing the robustness of fault isolation estimator for fault diagnosis in robotic systems; N.-B.Hoang, H.-J.Kang. Software-based Fault Detection/Recovery Technique for Cyber-Physical Systems; J.Lee, et al. Sample adaptive offset parallelism in HEVC; E.-K.Ryu, et al. Comparison between SVM and Back Propagation Neural Network in building IDS; Nguyen D.H., Nguyen L.G. Anomaly Detection with Multinomial Logistic Regression and Naive Bayesian; Nguyen D.H., Nguyen L.G. Implementation of Miniaturized Automotive Media Platform with Vehicle Data Processing; S.Y.Lee, et al. Design of Software-based Receiver and Analyzer System for DVB-T2 Broadcast systems; M.G. Kang, et al. Age-group Classification for Family Members Using Multi-layered Bayesian Classifier with Gaussian Mixture Model; C.Yi, et al. Enhancing utilization of integer functional units for high-throughput floating point operations on coarse-grained reconfigurable architecture; M.Jo, et al. An Improved Double Delta Correlator For BOC Signal Tracking in GNSS Receivers; H.Pham-Viet, et al. Implementation of Automatic Failure Diagnosis for Wind Turbine Monitoring System based on Neural Network; M.-S.An, et al. Development of Compact Microphone Array for Direction-of-Arrival Estimation; T.Q.Võ , U.Klein. Design and Implementation of a SoPC System for Speech Recognition; T.V.Hoang, et al. Professor James J. (Jong Hyuk) Park received his Ph.D. degree in Graduate School of Information Security from Korea University, Korea. From December, 2002 to July, 2007, Dr. Park had been a research scientist of R&D Institute, Hanwha S&C Co., Ltd., Korea. From September, 2007 to August, 2009, He had been a professor at the Department of Computer Science and Engineering, Kyungnam University, Korea. He is now a professor at the Department of Computer Science and Engineering, Seoul National University of Science and Technology (SeoulTech), Korea. Dr. Park has published about 100 research papers in international journals and conferences. He has been serving as chairs, program committee, or organizing committee chair for many international conferences and workshops. He is a president of the Future Technology Research Association International (FTRA) and Korea Information Technology Convergence Society (KITCS). He is editor-in-chief of Human-centric Computing and Information Sciences(HCIS) by Springer, International Journal of Information Technology, Communications and Convergence (IJITCC) by InderScience, and Journal of Convergence (JoC) by FTRA Publishing. Professor Hwa Young Jeong received the MS degree in computer engineering in 1994 and the Ph.D in computer engineering in 2004 from the Kyung Hee University. Currently, he is a Professor in the Humanitas College at Kyung Hee University, Seoul, South Korea. He is a reviewer of MTAP (Multimedia Tools and Application) at Springer. And he is a member of the Standard Words Committee in Ministry of Information and Communication Republic of Korea.